Two common missense variants in APOL1 (G1 and G2) have been definitively linked to CKD in black Americans. However, not all individuals with the renal-risk genotype develop CKD, and little is known about how APOL1 variants drive disease. Given the association of APOL1 with HDL particles, which are cleared by the kidney, differences in the level or quality of mutant APOL1‑HDL particles could be causal for disease and might serve as a useful risk stratification marker. We measured plasma levels of G0 (low risk), G1, and G2 APOL1 in 3450 individuals in the Dallas Heart Study using a liquid chromatography-MS method that enabled quantitation of the different variants. Additionally, we characterized native APOL1‑HDL from donors with no or two APOL1 risk alleles by size-exclusion chromatography and analysis of immunopurified APOL1‑HDL particles. Finally, we identified genetic loci associated with plasma APOL1 levels and tested for APOL1-dependent association with renal function. Although we replicated the previous association between APOL1 variant status and renal function in nondiabetic individuals, levels of circulating APOL1 did not associate with microalbuminuria or GFR. Furthermore, the size or known components of APOL1‑HDL did not consistently differ in subjects with the renal-risk genotype. 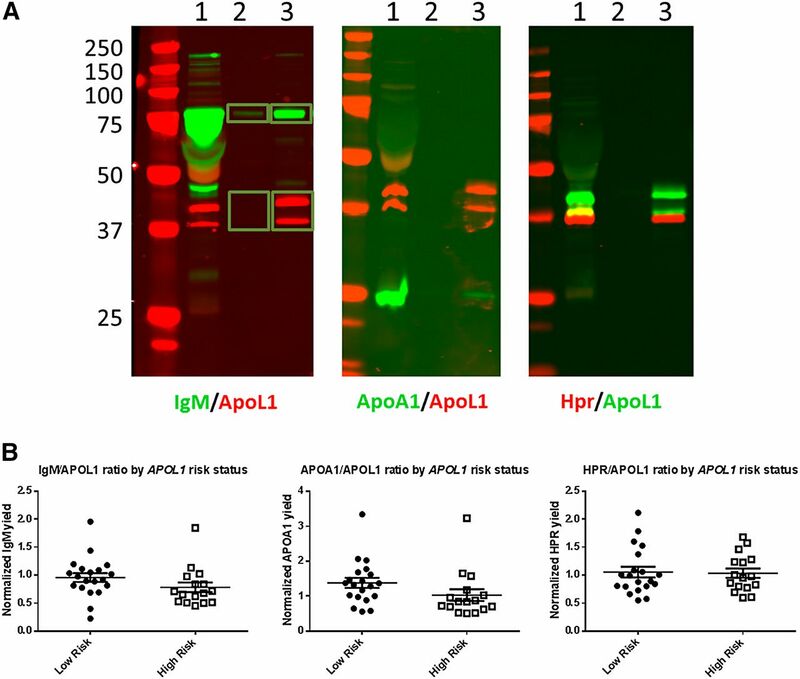 Genetic association studies implicated variants in loci harboring haptoglobin-related protein (HPR), APOL1, and ubiquitin D (UBD) in the regulation of plasma APOL1 levels, but these variants did not associate with renal function. Collectively, these data demonstrate that the risk of renal disease associated with APOL1 is probably not related to circulating levels of the mutant protein. The bulk of APOL1 is found in the plasma, where it circulates as part of a specialized HDL particle consisting of APOA1, APOL1 and the hemoglobin binding protein Haptoglobin-Related Protein (HPR), which also serves as the receptor for uptake by trypanosomes.15 A subset of APOL1‑HDL has also been shown to bind IgM and forms the distinct lytic factor TLF‑2.16 Because HDL is cleared in part through the kidney and because IgM may contribute to the pathophysiology of FSGS and other forms of glomerular disease,17–19 it is possible that the renal toxicity is dependent on the APOL1 in the circulation, rather than that expressed in the kidney. A mismatch between APOL1 mRNA localization and protein abundance in distinct renal cell types including the podocyte has recently been reported, and podocytes readily take up HDL, suggesting that APOL1 from the circulation may be taken up by distinct cell types in the kidney and contribute to the pathology of APOL1 nephritis.20 In either scenario, circulating variant APOL1 could contribute to kidney disease. A strong relationship between the levels of APOL1 risk variants in the circulation and CKD would provide correlative evidence that the circulating pool contributes to the pathophysiology of APOL1-related nephropathy. Although APOL1 risk alleles confer a greatly increased susceptibility to a variety of renal diseases, the majority of individuals with the risk genotype are asymptomatic. The reasons for this incomplete penetrance are unknown and it is currently not possible to identify those carriers of the RRG at greatest risk for developing CKD. Therefore, developing predictive biomarkers that could discriminate between low- and high-risk individuals is of significant interest. If circulating APOL1 contributes to renal disease, it is plausible that levels of APOL1 might identify those at greatest risk of developing CKD. Circulating APOL1 may also predict CKD risk even if the circulating fraction is not causal, but merely highly correlated with renal expression levels. Previous work has suggested that there was no association between plasma APOL1 and renal disease in a small HIV-associated CKD cohort,21 but, to date, no study has examined the relationship between APOL1 genotype, plasma APOL1 levels, and renal disease. We have recently developed a liquid chromatography (LC)‑MS method to specifically monitor the levels of distinct APOL1 variants in plasma.22 Here, we use this methodology to ask whether there is an association between the levels of APOL1 variants in renal disease in a large cross-sectional cohort, and to determine whether levels of circulating APOL1 could plausibly be used to distinguish those at greatest risk for developing renal disease. Characteristics of the Dallas Heart Study (DHS) participants are shown in Table 1. A total of 3450 individuals (52% black, 44% male, mean age 44±10 years) with available measurements of circulating APOL1 were included in the current study. Black participants had a higher burden of established CKD risk factors, such as diabetes, obesity, and hypertension, compared with white participants (14.2% versus 6.7%, 52.4% versus 35.8%, and 28.2% versus 11.5%, respectively, all P<0.05). However, they had a similar prevalence of obesity and diabetes as Hispanic participants (P>0.05). Despite a high rate of obesity, black participants had more favorable fasting lipoprotein profiles compared with white or Hispanic participants (P<0.05). APOL1 was measured in stored plasma samples from 3450 subjects in the DHS using a LC‑MS method described previously.22 Multiple peptides from APOL1 were measured, including a carboxy‑terminal–specific peptide (LNILNNNYK) that enabled us to quantify the levels of G0, G1, or G2 variant protein in the plasma, as well an internal peptide (ALDNLAR) that served as a control for quantitation. Correlation between values derived from the carboxy‑terminal peptide and the internal peptide were high, and consistent between APOL1 from different genotypes, demonstrating the high reproducibility and quality of the assays (Figure 1A). The slope of the linear regression line for single risk allele carriers was slightly more than half of that for the nonrisk allele carriers, suggesting that G0 APOL1 may circulate at slightly higher concentration than G1 or G2 APOL1 in these individuals (Figure 1C). Population characteristics of plasma APOL1 levels in the DHS. Data on G0, G1, or G2 APOL1 (LNILNN[NY]K) or full-length APOL1 (ALDNLAR) are presented. (A) APOL1 levels as determined by the carboxy‑terminal LNI peptide or the internal ALD peptide are highly correlated. The relationship was estimated by linear regression without an intercept. (B) Plasma APOL1 levels by ethnic status in DHS. APOL1 circulates at higher levels in black participants than in other ethnic groups. WT APOL1 refers to protein as quantified by the LNILNNNYK peptide. Total APOL1 refers to protein as quantified by the internal ALD peptide. (C) G1 and G2 APOL1, as measured by the LNI peptide, circulate at levels below G0 APOL1 in either one or two risk allele carriers. (D) APOL1, as measured by the ALD peptide, is poorly correlated with overall HDL levels, but is correlated with small HDL. (E) APOL1 is more significantly correlated with plasma APOA1 compared with HDL. Plasma APOL1 circulates across a 20‑fold concentration range, from approximately 100 to 2000 nM. Levels of total APOL1 (as defined by the internal peptide) were significantly higher (~50% elevated) in black participants compared with individuals of European (P=5.2×10–99) and Hispanic (P=4.8×10–42) origin (Figure 1B, right panel). Similar results were obtained when the analysis was restricted to WT allele homozygotes (G0/G0) (data not shown). Consistent with the correlations seen between the internal and carboxy‑terminal peptides, the levels of G1 and G2 APOL1 were lower than G0 APOL1 in heterozygotes and homozygous individuals with a more pronounced effect on the G2 variant (approximately 50% reduction compared with G0/G0; P=6.5×10–43 for G0/G2, P=5.9×10–7 for G2/G2) suggesting some change in biogenesis or elimination of this variant compared with the others (Figure 1C). As previously described, there was no association between APOL1 RRG and most baseline population characteristics, although subjects with the RRG had an elevated BP (P=0.02) and a higher prevalence of hypertension (P=0.01), consistent with an increased risk of CKD (Table 2). In addition, RRG carriers had slightly lower fasting glucose (P=0.04), and lower total cholesterol (P=0.01) and LDL cholesterol levels (P=0.03). We did not see a difference across genotypes in the total plasma HDL cholesterol levels, or HDL lipoprotein particle distribution (Table 2). APOL1 genotype did not correlate with C-reactive protein or other inflammatory markers (Table 2). Consistent with our observation of lower circulating levels of G2 APOL1 variants, RRG carriers had significantly decreased levels of total APOL1 (P<0.001, Table 2). As had been previously shown, carriers of the RRG among nondiabetic, but not diabetic individuals, had a higher median albumin-to-creatinine ratio (ACR) and a higher prevalence of microalbuminuria and GFR<60 ml/min per 1.73 m2 compared with non-RRG individuals (Table 2).23 The association was confirmed when using genotype calls based on the LC‑MS protein analysis (Supplemental Table 1). We next tested whether circulating APOL1 levels correlated with renal disease risk factors, and plasma lipoprotein and cytokine levels. Because APOL1 and lipoprotein levels differed significantly across ethnic groups, we restricted this analysis to black individuals. Although APOL1 circulates as part of an HDL particle, there was no association between total plasma APOL1 and HDL cholesterol levels (Figure 1D, middle panel and Table 3). Despite the absence of an association with HDL, APOL1 levels were strongly positively correlated with plasma APOA1 levels (r=0.39, Table 3), even though HDL and APOA1 levels are strongly positively correlated with each other (Figure 1E). Circulating APOL1 levels were positively associated with C-reactive protein (P<0.001, Table 3), IL‑6 (P=0.04), and IL‑18 (P=0.01), but were not associated with other inflammatory markers. There was no correlation between total plasma APOL1 levels and urine ACR or GFR (P>0.05, Table 3). To determine if levels of variant-specific APOL1 were associated with CKD, we used multivariable logistic regression models adjusted for age, gender, and BP. The analyses of each protein variant (G0, G1, or G2) were restricted to individuals carrying corresponding alleles. Although total levels of the variant protein (G1+G2 APOL1) were associated with increased incidence of microalbuminuria, GFR, and total CKD in nondiabetic individuals, these associations became nonsignificant when corrected for the number of risk alleles (Table 4). Similar results were obtained when analyzing individuals with or without the RRG separately (Table 5), and in the combined black cohort (including both patients with diabetes and nonpatients with diabetes, Supplemental Tables 2 and 3). Moreover, no significant association was detected when the analysis was done using the ratio of G1/G2 to G0 APOL1 levels in single risk allele carriers (data not shown). Thus, there is no evidence for a cryptic risk of renal disease in those individuals in whom risk allele APOL1 exceeds that of G0 APOL1 in the circulation. Although no association was detected between the levels of circulating APOL1 variants and renal disease, it remained possible that changes in the quality rather than quantity of the APOL1 particle contributed to renal dysfunction. Therefore, plasma and matched DNA from 59 healthy young black males and 14 subjects with ESRD was procured. Individuals were genotyped by Sanger sequencing and the size distribution of APOL1‑HDL was monitored by size-exclusion chromatography followed by quantitation of total cholesterol or APOL1 across the fractions. APOL1 migrated in three predominant molecular mass bins, at >1 MDa, 300–600 kDa, and a lower molecular mass bin of 100–200 kDa, a distribution that roughly matches what has been reported for density-gradient purified APOL1‑HDL (Figure 2A). The high mol wt APOL1 corresponds to the IgM-bound particle known as TLF‑2 and there was no evidence for any significant amount of monomeric APOL1 in plasma, consistent with previous reports.16 There was no association between any of the different size bins and APOL1 risk genotype, in either healthy subjects or those with ESRD (Figure 2B). Size distribution of APOL1 particles in EDTA plasma from subjects with or without the RRG, with or without ESRD as measured by size-exclusion chromatography on a Superdex 200 column. (A) Representative chromatograms of total cholesterol (dashed) or APOL1 (solid) in neat plasma separated by size-exclusion chromatography. The cholesterol peak eluting at 8 ml represents LDL and VLDL eluting in the void volume of the column, the heterogeneous cholesterol peak between 12 and 13 ml represents HDL. A fraction of APOL1 consistently elutes with VLDL/LDL and represents IgM-bound APOL1. The remaining APOL1 elutes largely between the HDL peak and the void volume suggesting a mol wt greater than the bulk of the HDL pool. Traces from healthy subjects and subjects with ESRD with or without the RRG are shown. (B) APOL1 levels in the normalized high, medium and low mol wt pools in five subjects without the RRG or seven subjects with the RRG are shown. Differences between low- and high-risk genotypes were tested by t test. No statistically significant changes (P<0.05) were noted. Analysis of the protein complement of APOL1‑HDL in subjects with or without the RRG. (A) Representative images of semiquantitative immunoblotting to determine the relative amounts of APOL1‑HDL proteins within the particle. APOL1‑HDL was immunopurified from EDTA plasma under detergent-free conditions, and proteins were eluted with Laemmli buffer and separated via SDS‑PAGE. One percent of input (lane 1) and 10% of immunopurified material from control (lane 2) or APOL1 (lane 3) immunoprecipitations was loaded in each lane and blotted with antibodies specific for the proteins noted under each image. Shown is an overlay of signal from the 680 nm channel (rabbit antibodies) and the 800 nm channel (mouse antibodies). Yellow indicates areas of overlap in the overlay. Signal was quantified separately for regions of interest for each channel. The yield of APOA1, HPR, and IgM were determined relative to the input amount and normalized for the yield of APOL1 calculated for each image. (B) APOL1‑HDL was purified from EDTA plasma using from 20 subjects without and 16 subjects without the RRG and the relative levels of known APOL1‑HDL associated proteins were determined by semiquantitative immunoblotting, as detailed above. Differences between low- and high-risk genotypes were tested by t test. No statistically significant changes (P<0.05) in the APOL1 normalized levels of IgM, APOA1, or HPR were noted. 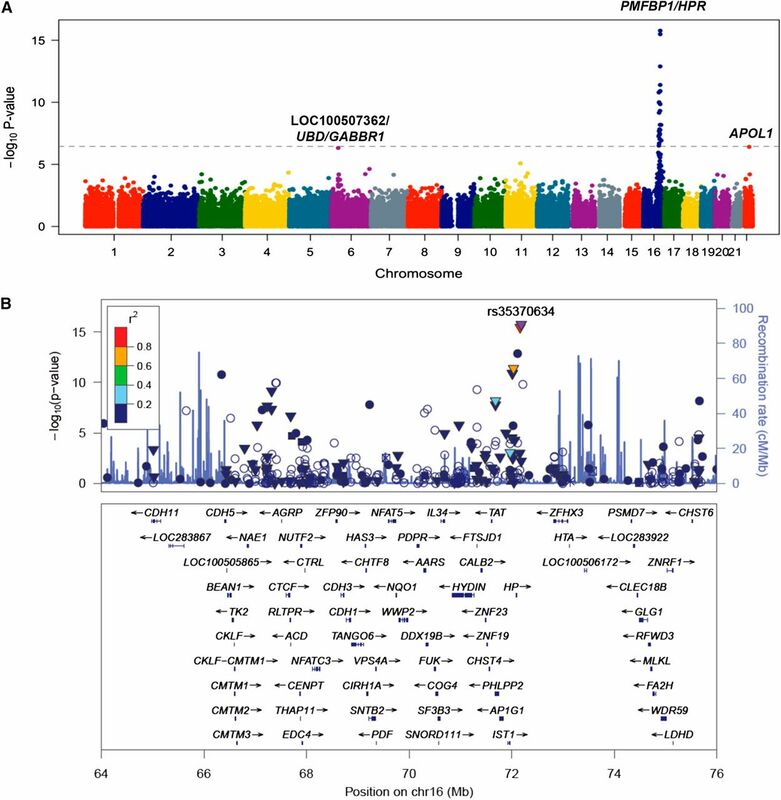 To determine if levels of circulating APOL1 were influenced by genetic variation in APOL1 or other genomic loci, we performed an association analysis using variants on the Illumina HumanExome chip. A total of 144782 variants were tested for association with APOL1 levels in 3354 DHS participants with available genotypes and APOL1 data. Several variants on chromosome 16, in a 10 Mb locus containing the HPR gene reached exome-wide significance (lead single nucleotide polymorphism [SNP]: PMFBP1 E48K rs35370634, P=2.1×10–16). In addition, two variants approached our exome-wide significance threshold: a coding variant in APOL1 (G96R, rs41297245, P=4.2×10–7) and an intergenic SNP, located approximately 22 kb downstream of the ubiquitin D (UBD) gene on chromosome 6 (rs1233421, P=4.9×10–7). Fine-mapping analysis of the chromosome 16 locus (position between 66 and 76 Mb) revealed several independent SNPs (defined as R2<0.2 with the index SNP) associated with APOL1 levels (Figure 4, Supplemental Table 4). Specifically, an intronic variant in HPR (rs2000999) previously shown to be associated with lipid26,27 and haptoglobin levels,28 remained independently associated with circulating APOL1 levels, after conditioning on the index SNP (rs35370634) (P=3.8×10–14). In addition, three other SNPs in the HPR locus remained associated with APOL1 levels in joint analysis with P<3.5×10–7. Together, these five variants on chromosome 16 (with P<3.5×10–7 in joint analysis), APOL1 G96R rs41297245, and rs1233421 explained 8.5% of variance in APOL1 levels, after adjustments for demographic variables and APOL1 G1 and G2 genotypes (11.8% of variance in black participants). We next tested whether the variants affecting circulating APOL1 levels were associated with kidney disease. None of the variants was associated with measures of renal function, or total CKD, in the combined DHS population (Supplemental Table 5). However, the HPR rs2000999 variant was associated with GFR<60 ml/min per 1.73 m2 (OR=1.9; P<0.01 in the combined DHS population), although the association was present only in black individuals (OR=2.3; P<0.01) and not in the other ethnic groups. To test whether these associations represent the causal effect of circulating APOL1 levels on kidney disease, we further included plasma APOL1 levels as a covariate in the model. The association of the HPR rs2000999 variant with the prevalence of GFR<60 ml/min per 1.73 m2 in black participants and ACR levels in white participants remained significant in this analysis (P=0.03 and P=0.02, respectively), suggesting that the effect of genotype on kidney function is independent of its effect on the amount of APOL1 in the circulation. These results also add to a number of other studies that circumstantially implicate renally expressed APOL1 as the primary source of the damage in individuals with the RRG. These lines of evidence include transplant data suggesting that allograft survival tracks with donor rather than recipient genotype29–31; evidence from studies in human cells and biopsy data demonstrating that APOL1 is expressed in the podocyte and may have detrimental effects in that cell type7,12,20,32,33 and cell biologic and epidemiologic studies demonstrating that APOL1 is induced by innate immune effectors in podocytes, which may account for the variable penetrance of the RRG seen in different forms of renal disease.7,34,35 Although it is difficult to rule out the potential effects of transient changes in circulating APOL1 levels (i.e., due to infection) or a threshold effect (the damage occurs at levels above or below those monitored), the lack of an association between plasma APOL1 and prevalent renal disease in the DHS is in line with these previous observations. The strengths of this study are the high-quality analytical methods used, which enabled the testing of a number of hypotheses regarding APOL1 levels and APOL1‑HDL–associated proteins and renal disease, including the association of specific variant proteins with CKD. This study was well powered and was done in a cohort with pre-established association between APOL1 genotype and risk of CKD. The wide range of APOL1 concentrations in the study subjects further enabled a robust test of the hypothesis that levels of APOL1 associate with CKD. Finally, this is the first study to examine in detail the size distribution and protein complement of APOL1‑HDL in risk allele carriers. Some limitations should also be noted. First, this study was done in a population-based cohort with a relatively low level of prevalent renal dysfunction. Results might be different in a CKD disease cohort stratified by risk genotype. Second, we have limited data on the day-to-day variability in APOL1 levels in the plasma, which may influence our ability to detect associations with renal disease. Finally, we were unable to test the prognostic utility of plasma APOL1 levels due to the limited number of hard renal event in DHS. Nevertheless, the DHS likely reflects the general at-risk population more accurately than case–control cohorts and thus it remains likely that APOL1 levels have little utility in predicting renal risk in the general population. It may also be possible to revisit the prognostic utility of plasma APOL1 in the future as renal events accrue in DHS. An association between the APOL1 RRG and cardiovascular (CV) risk in the Jackson Heart studies has recently been demonstrated.37 It was speculated that this may reflect dysfunction in the APOL1‑HDL particle. Although no obvious genotype associated changes in APOL1‑HDL size and protein complement were found in our study, and no association with CV disease was seen in this population (Supplemental Table 6), a dissociation between the effect of circulating APOL1 on renal and CV outcomes would be highly interesting and further strengthen the hypothesis that kidney expressed APOL1 is causal for the renal effects. Although the size and protein complement of APOL1‑HDL was examined, a more comprehensive evaluation of the functionality of the HDL particles was not done and is beyond the scope of this work. Further work in this area is clearly warranted and may be facilitated by investigation of the genetic drivers of plasma APOL1 identified in this report. In sum, this study demonstrates that levels of total or mutant APOL1 in the circulation are unlikely to be useful risk stratification markers in individuals with the APOL1 RRG. This data combined with the lack of association between genetic drivers of APOL1 levels and renal disease, as well as the lack of obvious differences in the protein complement of risk allele APOL1 particles provides additional evidence in favor of models in which renally expressed APOL1 is the primary driver of kidney disease. Finally, we demonstrate that there are no obvious differences in the composition of the APOL1‑HDL particle, but do identify significant differences in the levels of circulating G2 APOL1 that may reflect underlying functional differences in the clearance or biogenesis of this variant. The DHS is a multiethnic population-based probability sample of Dallas County residents (ages 18–65 years), with intentional oversampling of black participants. The sampling design and recruitment procedures have been previously described.38 Briefly, 3551 individuals (52% black, self-identified as [non-Hispanic] black; 29% individuals of mixed European descent, self-identified as [non-Hispanic] white; 17% Hispanics, self-identified as Hispanic; and 2% other ethnicities) completed a detailed survey, and underwent a health examination that involved measurement of BP, anthropometry, blood, and urine sample collection, and imaging studies. The ethnicity was self-assigned according to the US Census categories. The study was approved by the Institutional Review Board of the University of Texas Southwestern Medical Center, and all subjects provided written informed consent. Genomic DNA was extracted from circulating leukocytes. A total of 3544 DHS participants were genotyped for the APOL1 rs73885319 (G1) and rs71785313 (G2) polymorphisms using a predesigned TaqMan AD assay (Applied Biosystems), as previously described.23 Genotype success rates were 98.3% for rs73885319 and 99.2% for rs71785313. Plasma lipoprotein particle profiles were measured by nuclear magnetic resonance spectroscopy using the LipoProfile-II algorithm at LipoScience, Inc. (Raleigh, NC). APOL1 was measured in stored plasma samples from 3551 DHS subjects using an MRM‑LC–MS assay published previously using table isotope-labeled peptides as internal standards.22 This assay was also used to generate LC-MS based genotype calls. Measurements were not available for some participants due to no sample (n=96) or ID mismatch (n=3). After exclusions, APOL1 measurements were available for 3450 DHS subjects. Human EDTA plasma and corresponding DNA samples were obtained from Bioreclamation (Hicksville, NY). Informed consent was obtained from each of the donors for the analysis of DNA and plasma samples. DNA was prepared using the PAXgene Blood DNA system. Blood was collected into PAXgene Blood DNA tubes (Qiagen #761115), shipped at ambient temperature, and stored at 4°C until processing. DNA was prepared from whole blood using the PAXgene DNA kit (Qiagen #761133) within 2 weeks of receipt, according to the manufacturer’s directions. DNA from exon 5 was amplified using Forward and Reverse primers: APOL1‑Ex5–2F 5′AGCCAGAGCCAATCTTCAGTC3′ and APOL1‑Ex5–2R 5′GCAGATCAAGAGGTCAGGAGA3′. DNA was sequenced using the forward primer above and the reverse primer APOL1‑Ex5SeqR 5′GTTTGCATTTTGTCCTGGCCCC3′. Aliquots of frozen EDTA plasma from subjects with or without the RRG were thawed on ice. Protease and lipase inhibitors were added to 100 μl of plasma and clarified by centrifugation through an ultracentrifugation unit (Microcon, 10K MWCO). Samples (50 ul) were loaded onto a Superdex 200 10/300 column (GE Lifescience) attached to an Agilent 1100 HPLC system and fractionated at 0.4 ml/min using 1× PBS–1 mM EDTA as the mobile phase. Fractions (250 μl) were collected from 5 to 24 ml (76 fractions) and were analyzed immediately for total cholesterol (Wako Cholesterol E kit, #439–17501) or APOL1 using an in-house sandwich ELISA assay. APOL1 concentration was determined through use of an electrochemiluminescence immunoassay on the Meso Scale Discovery Assay (MSD) Platform that is capable of measuring the circulating human APOL1 in the peripheral blood. The capture reagent was a rabbit monoclonal anti-APOL1 antibody, (cat# ab108315; Abcam, Inc.), rabbit anti-hAPOL1, that was conjugated to biotin and immobilized onto the surface a MSD streptavidin plate. The detection antibody was a goat anti-hAPOL1 antibody (cat# SC-18759; Santa Cruz Biotechnology), that was labeled with Ruthenium Tris‑bipyridine. The antigen–antibody complex was captured by streptavidin, which was coated on the MSD plate surface. Plates were processed into the MSD MESO SECTOR S 600 plate reader and the electrochemiluminescence signal produced was verified as directly proportional to the concentration of human APOL1 in the sample using LC‑MS–calibrated HDL as a reference. The assay was verified as fit-for-purpose for use with human plasma diluted in the size-exclusion chromatography mobile phase (PBS–1 mM EDTA) through spike-in recovery experiments. Total rabbit IgG or anti-APOL1 antibody (cat# ab108315; Abcam, Inc.) was directly coupled to agarose beads using the Pierce direct immunoprecipitation kit (#26148) at 100 μg/200 μl beads slurry. One hundred microliters of EDTA plasma from subjects with or without the RRG was precleared with 100 μl of rabbit IgG beads in a microcolumn supplied in the kit for 2 hours with rotation at 4°C. Precleared plasma (45 ul) was then added to a fresh microcolumn containing 40 μl of a rabbit IgG beads or anti-APOL1 beads and rotated for another 2 hours at 4°C. Residual precleared plasma was kept as the input reference. Beads were washed five times with PBS–EDTA followed by two sequential elutions at 25 and 75 μl. Elution buffer samples were stored at –70°C prior to subsequent analysis by immunoblotting. Either 0.5 μl of precleared input sample or 10 μl of immunopurified APOL1 particles in a final volume of 15 μl 1× Laemmli sample buffer was run on 10% polyacrylamide gels in 1× 3‑(N-morpholono)propanesulfonic acid running buffer (Novex Bis-Tris). Positive reference samples were included on each gel for normalization. Proteins were transferred to nitrocellulose using standard wet electroblotting techniques. Membranes were blocked for 30 minutes in Odyssey blocking buffer (LI-COR) followed by incubation with anti-APOL1, anti-HPR, anti-APOA1, and anti-IgM antibodies in Odyssey blocking buffer +0.1% Tween‑20 overnight at 4°C. Membranes were washed in PBS–0.1% Tween‑20 and incubated with secondary antibody for 30 minutes. After washing, membranes were imaged using an Odyssey infrared imager and quantified using manufacturers software. Background corrected signal was used to calculate the relative yield of each protein, with subsequent normalization to APOL1 yield and positive controls on each membrane. Characteristics of DHS participants are summarized as mean (±SD) or median (25th to 75th percentile) for continuous data, and n (%) for categorical data. Baseline characteristics were compared across ethnic groups using linear regression for continuous data and logistic regression for categorical data. The relationship between health outcomes and APOL1 genotypes and circulating APOL1 levels was assessed using linear and logistic regression for continuous and categorical outcomes, respectively. All models were adjusted for age, gender, BMI, systolic BP, and diabetes, where appropriate. The relationship of APOL1 levels with CKD phenotypes and plasma lipoprotein and cytokine levels was assessed using the Spearman rank correlation coefficient. To account for the effect of confounders, we computed partial Pearson correlation coefficients (r) based on linear regression models adjusted for age, gender, BMI, and the number of APOL1 risk alleles, with plasma APOL1 levels as a predictor and a particular characteristic as the outcome. A logarithm or an inverse normal transformation was applied to variables with skewed distributions (e.g., BMI, BP, and plasma lipoprotein and cytokine levels) to achieve approximate normality of the residuals. P<0.05 was considered statistically significant. All statistical analyses were performed using R statistical programming language (http://www.R-project.org). The association between circulating APOL1 levels and Exome Chip genotypes was tested using linear regression, assuming an additive genetic model (with genotypes coded as 0, 1, or 2 for common allele homozygotes, heterozygotes, and rare allele homozygotes, respectively) and adjusted for age, gender, and 10 leading principal components of ancestry, estimated using EIGENSTRAT45 (software version 4.2). For very rare variants (≤8 carriers), the analysis was performed using the Wilcoxon rank-sum test, without covariate adjustment. An inverse normal transformation was applied to circulating APOL1 levels to achieve approximate normality of the residuals. Exome-wide significance level was set at P<3.5×10–7, correcting for the number of variants tested (n=144 782). To determine all independently associated variants at each locus reaching exome-wide significance, we performed conditional and joint analysis using a stepwise selection procedure as follows. First, the most significant SNP with P<3.5×10–7 was included in the model, and all the remaining SNPs were tested for association with APOL1 levels conditional on the first SNP. Next, the most significant SNP with conditional P-value <3.5×10–7 was added to the model and the remaining SNPs were tested for association conditional on the selected SNPs, whereas SNPs with P>0.05 were dropped from the model. The procedure was repeated until no more variants reached a significance level of <3.5×10–7 conditional on the previously selected SNPs. All authors except J.K. were employees of Merck and Company, Inc. at the time the work was done. D.H.S. was supported by the National Center for Advancing Translational Sciences of the National Institutes of Health under award number UL1TR001105. The authors wish to thank Jonathan Cohen, Sevgi Gurkan, and Lijun Ma for helpful discussions and comments on the manuscript. The authors also wish to thank PharmaCadence for help in the measurement of plasma APOL1 in the DHS. This article contains supplemental material online at http://jasn.asnjournals.org/lookup/suppl/doi:10.1681/ASN.2015101121/-/DCSupplemental.